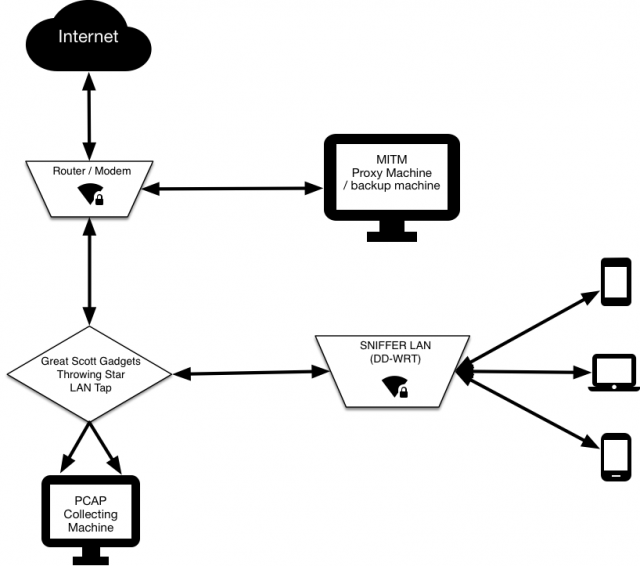 SNIFFlab is a set of scripts in Python that enable you to create your own MITM test environment for packet sniffing through a WiFi access point. All traffic on the network is logged by a Raspberry Pi dedicated to that task. The traffic is cloned by a Great Scott Gadgets Throwing Star LAN Tap, which routes it both to its destination, and to our Raspberry Pi. The Pi continually collects packet data, creating new packet capture (pcap) files at a regular interval, or once the active file reaches a configurable size. Saved files are regularly transferred to another machine for persistent storage. Users with SSH access to the Pi can also manually restart the pcap service, to get instant access to the captured packets, instead of waiting for the interval. The custom certificate that each client must install enables the proxy server through which SNIFFlab routes its traffic to intercept HTTPS requests to the outside world, and re-encrypt them using certificates generated on-the-fly. This allows for the researcher to later decrypt most captured network traffic sent over HTTPS.